Hmmm, I seem to be on a spinach roll lately don’t I? I do LOVE spinach and the fresh baby spinach at the market has just looked so enticing lately. 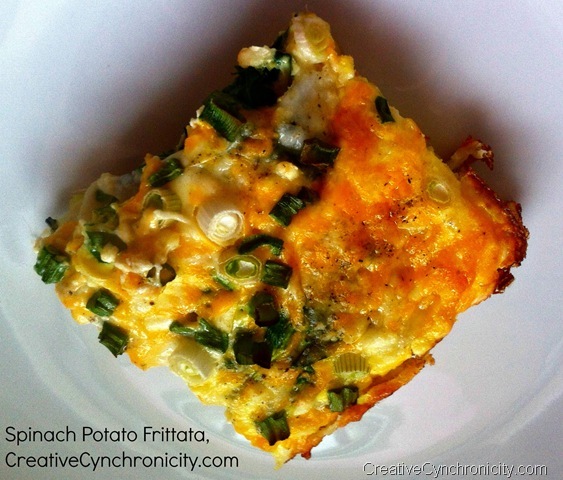 This spinach potato frittata recipe is actually one that’s really easy to customize to your likes and is a great one for using up leftovers. 1/2 cup milk or cream – Almond or Soy milk is really delicious in this too! Basil, rosemary, and others of your favorite herbs are nice additions to this! 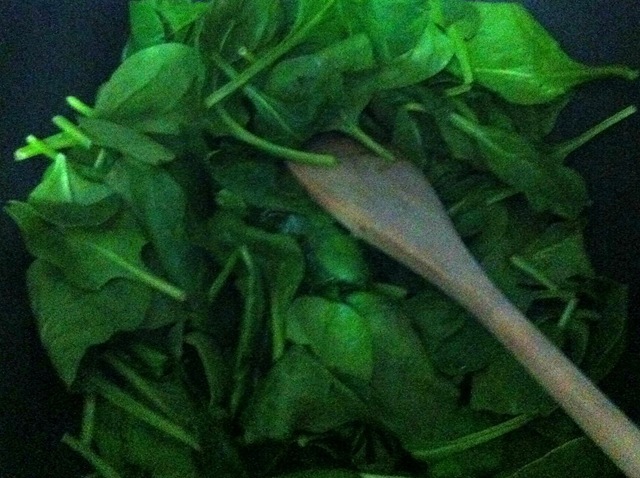 Saute the spinach with the garlic in a bit of butter or olive oil. If using other vegetables, you might want to steam or saute them before adding to the frittata to ensure that they are thoroughly cooked. Potatoes can be par-boiled if you choose to cut them in chunks instead of thinly slicing them. I don’t peel them but you can if you’d like. I used a 9 inch square baking pan but any similarly sized baking dish or oven safe skillet will work. Be sure to oil it or spray with cooking spray to prevent sticking. 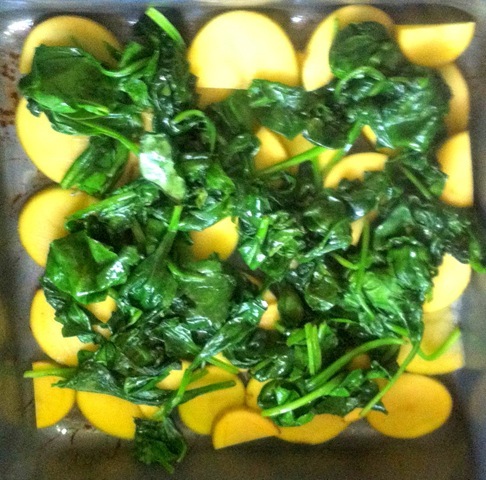 I laid the potato slices in the bottom of the pan first and then topped with the spinach. Next I topped the spinach/garlic mixture and potatoes with the cheeses. Whisk the eggs together with the milk and pepper. 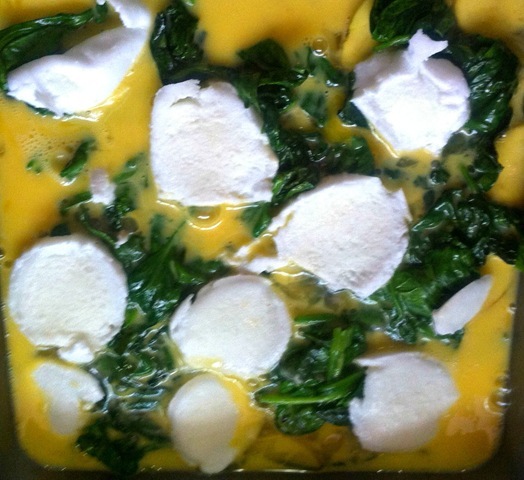 Pour this over the spinach, potatoes, and cheeses in the baking dish. Top with the green onions. Bake in a 400 degree oven for 15-20 minutes until the eggs are fully set. You can insert a knife in it and there shouldn’t be any liquid egg on it when you pull it out. I like to run a knife around the edges before I attempt to cut and serve just to ensure that it comes out of the pan nicely. 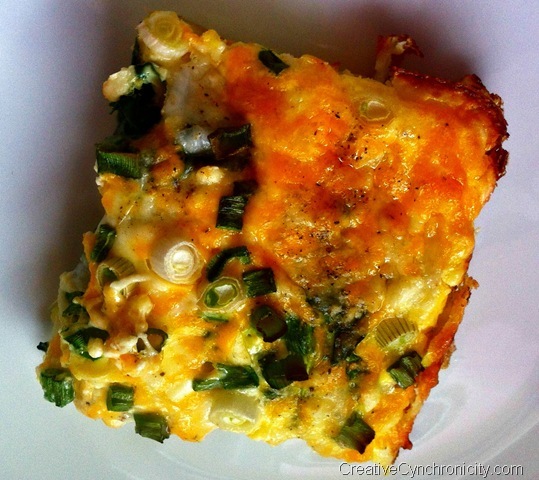 Really delicious, quick and easy to make, and oh so yummy! I love eggs, cheese, and potatoes. Thanks for the meatless recipe im a vegetarian! Looks deelish!!! I’m with Kristin 🙂 Thanks for sharing! 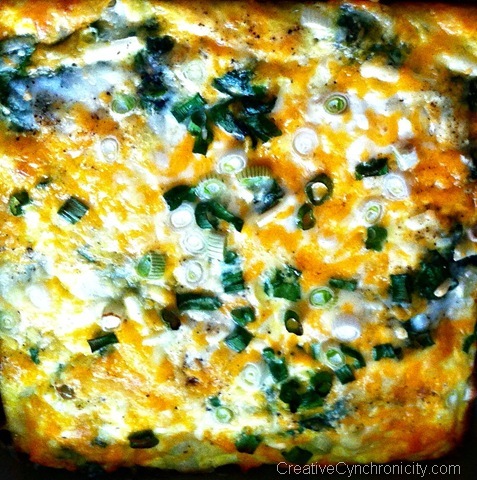 Anything that is easy to make and has eggs, spinach, and cheese? Count me in!